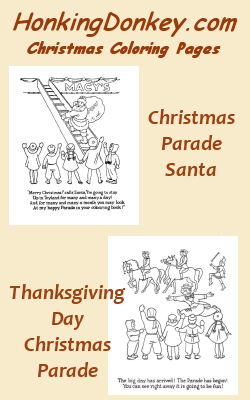 Welcome to our Christmas Parade coloring pages . Our Christmas Parade Coloring Pages feature some of the favorite kids Christmas Parade activities that kids love for this special holiday. Christmas Parade Coloring Page Sheets make great Sunday School activities for young kids during the Christmas time. The Macy's Thanksgiving Day Parade is an annual parade presented by the store chain Macy's. The tradition started in 1924, tying it for the second-oldest Thanksgiving parade in the United States. The three-hour Macy's event is held in New York City starting at 9:00 a.m. EST on Thanksgiving Day. The Macy's Thanksgiving Day Parade has been televised nationally on NBC since 1952. Christmas Parades are a major seasonal public event in many cities across the United States. Most larger towns and cities schedule their parade in early December to kick off the Christmas shopping season. Print several of our Christmas Parade coloring pages to talk about all the wonderful things that kids can see in the Christmas Parade! Our Christmas Parade are a great teaching aid to teach kids the history and significance of the annual Christmas Parade, .... using Christmas Parade Coloring Pages! Please Help us improve: Please Take our survey !